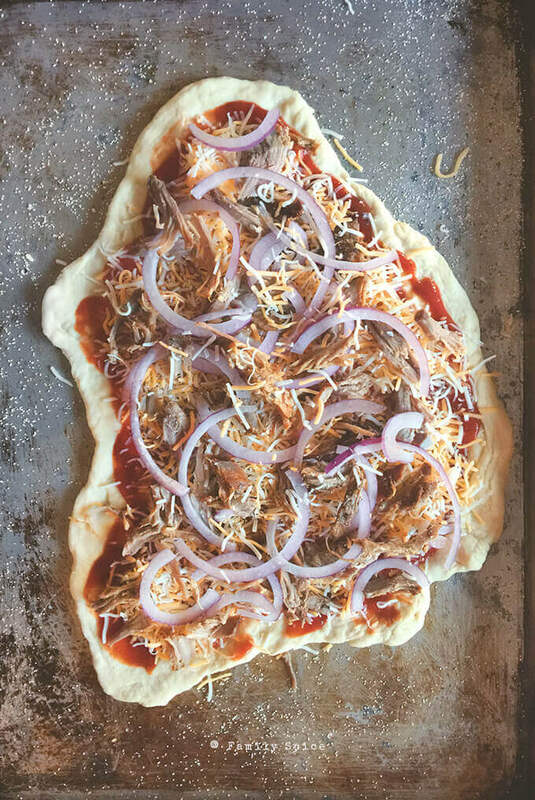 When you’ve got leftover pulled pork from the crockpot or the grill, create an easy weeknight meal with this Leftover Pulled Pork Pizza. Find more leftover pulled pork recipes here. My family is a huge fan of making pulled pork. It’s super easy to throw a pork shoulder roast in the slow cooker, but it is extra special when slow roasted and smoked over the grill. And no matter how we make it, we are guaranteed with lots of leftover pulled pork! Another family favorite meal is the pizza, of course. So why not make some leftover pulled pizza? For leftover pulled pork pizza, you can go all homemade or take it easy on yourself with pre-made ingredients. That means refrigerated pizza dough, store bought marinara, store bought barbecue sauce and shredded cheese. If you prefer to go all homemade, then by all means, go for it. I won’t be offended. And of course, you can do a little of both. 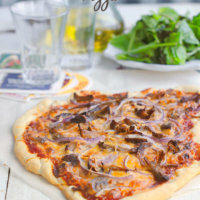 When I have time, I love making homemade pizza dough, but otherwise Trader Joe’s pre-made pizza dough is such an easy and delicious alternative. 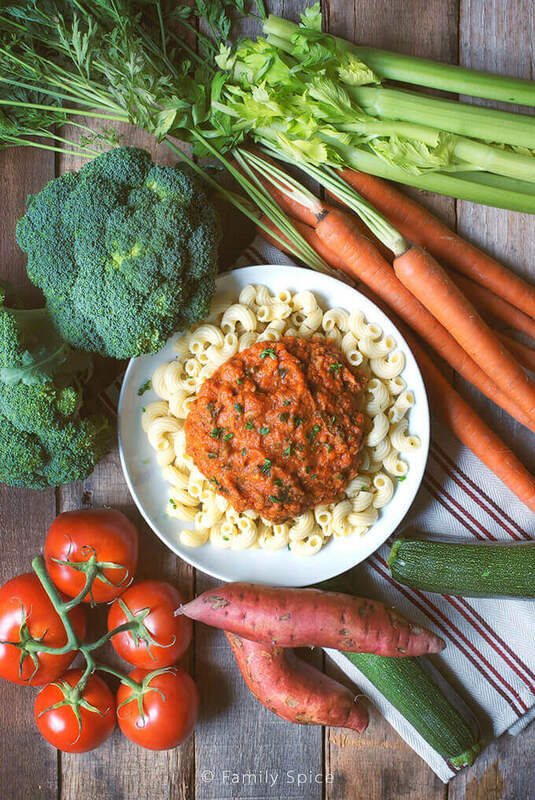 And I have a delicious homemade marinara recipe made with vegetables. My daughter is always on board to make homemade pizza dough. She also loves playing with slime. There is something about smashing that dough and massaging it into submission that she finds relaxing. 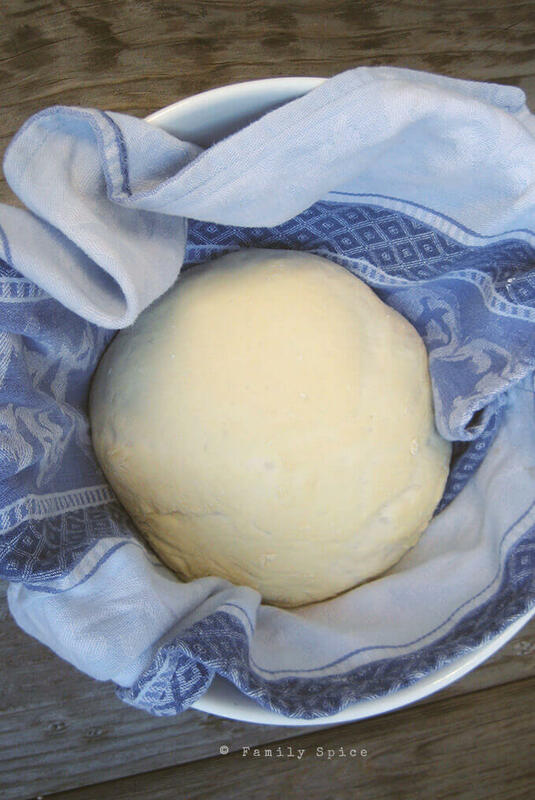 All it takes to make homemade pizza dough is some flour, yeast, warm water and olive oil. The key with working with yeast is to let it bloom in warm water not hot water. You do not want to kill the yeast. A simple test is to stick your finger in the water. You want it warm but you do not want the water to burn your finger. 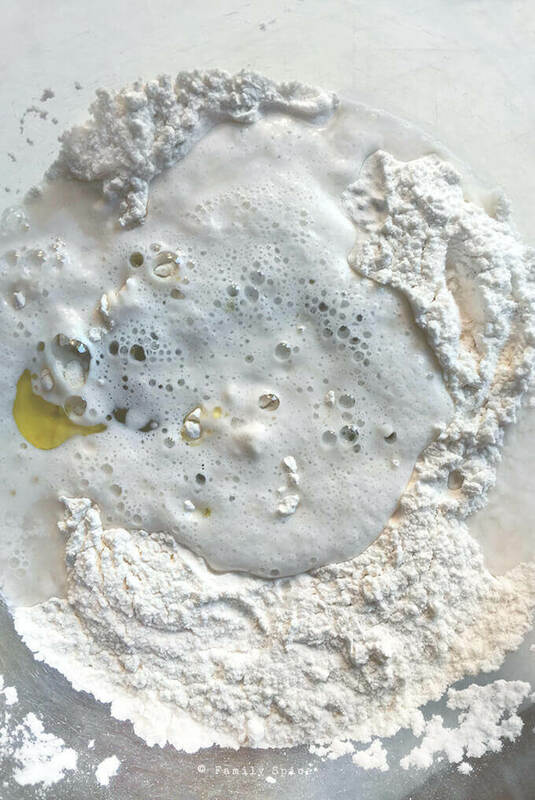 When the yeast has bloomed and turned foamy, it is ready to mix with flour and olive oil. 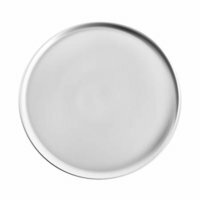 It’s sticky at first, but the more you work the dough over a floured surface, the smoother the dough becomes. As I’m not super patient to do this task, I hand this kneading job to my daughter. 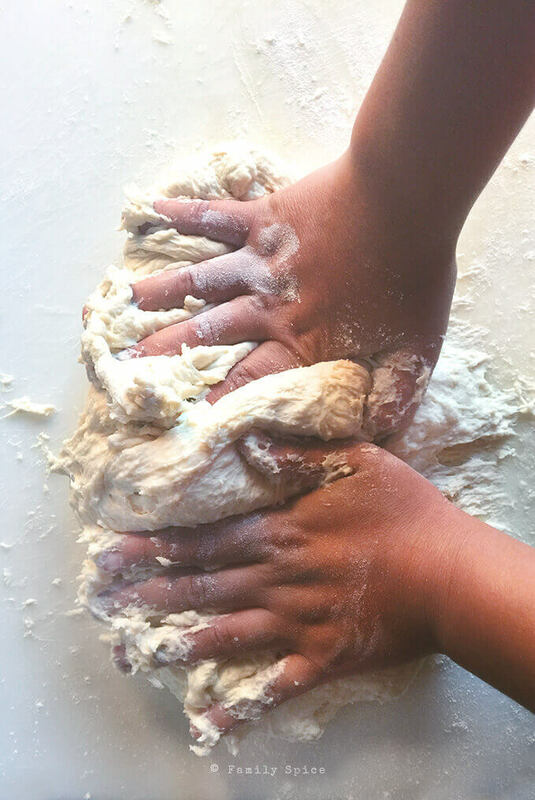 Her infatuation with play-doh and slime makes her the BEST assistant to kneading pizza dough! She never gets bored and is always bummed when I tell her the dough is ready and it’s time to stop! I used to fail miserably with homemade yeast breads because I was always chasing the warm spots of the house for my bread to rise. My new ovens have a proof option, creating the perfect cozy temperature for yeast doughs to rise. Just place your dough in a lightly oiled bowl and cover with a towel. 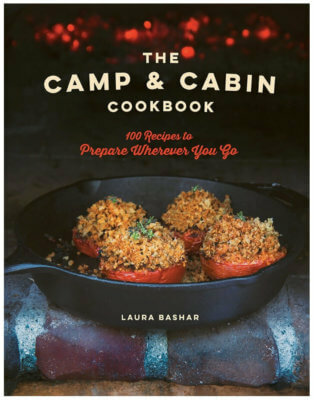 I sometimes wrap it in a kitchen towel or let it rest on the cutting board, covered with a towel. Let your dough rise until it is double in size, about 2 hours. Again, this all depends on how friendly and warm your space is. 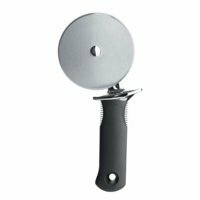 Kneading the pizza dough insures that the bands of gluten in your dough is strong and that your bread or pizza crust will hold its shape. In the end, you want a smooth slightly elastic dough. Once you get the dough prepped, it’s ready to get it on pizza pan. The best way to keep your pizza dough from sticking to your pan is to corn meal. Think of them as little beads that lift your dough from the pan. Some people grease their pizza pan, but I have found that corn meal is more effective at keeping your dough from sticking. Once your dough is spread out and on your pizza pan, it’s time for the sauce. I like to use 50-50 marinara and barbecue sauce. Not too much zing, but just enough. Then pile on the shredded sharp cheddar cheese and slices of red onions. I’m not a pineapple fan on my pizza, but if you like to add something sweet, go for it. 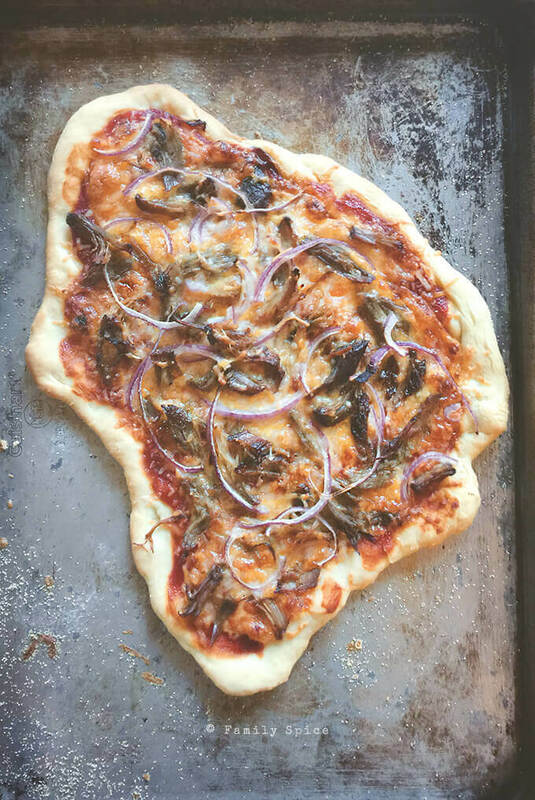 My daughter helped prepare this pizza on a regular baking sheet, hence the odd shape! Rest assured, that this pizza dough recipe makes one 9-inch round pizza. This leftover pulled pork pizza turned out so tasty. Not too much barbecue sauce, but just enough. I also like to top it with fresh cilantro and some arugula, but not everyone is a fan of salad on their pizza. Serve a spicy arugula salad on the side, if you prefer. And keep making that pulled pork! 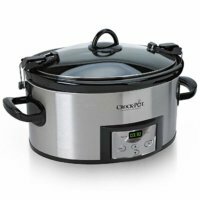 Pulled pork is an easy meal to throw together in the crockpot. But, what about the leftovers? 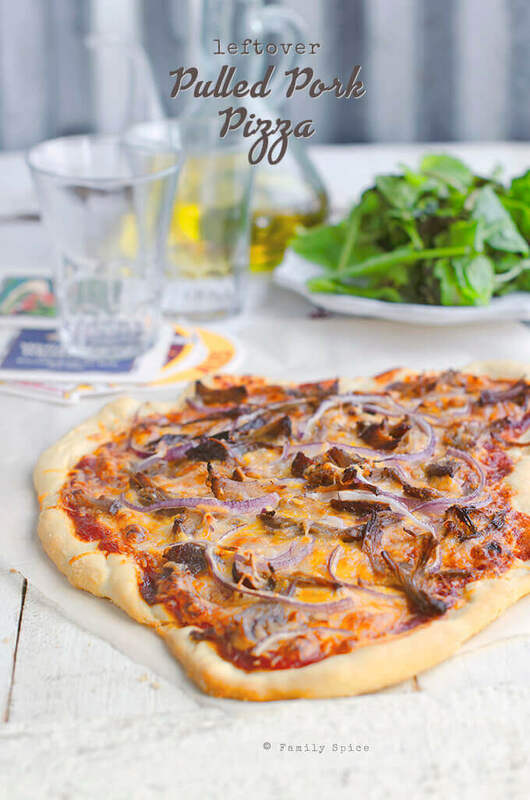 This Leftover Pulled Pork Pizza is perfect for an easy weeknight dinner. In a measuring cup combine yeast and warm water. Wait until mixture is creamy, about 10 minutes. Stir in cold water and olive oil. In a medium bowl mix flour and salt with a fork. Pour yeast mixture into the flour mixture and mix until sticky dough forms. Place dough on well-floured surface and knead until smooth, about 10 minutes. Cover dough with towel, in a bowl and cover for 15 mins. Knead dough again and place dough on a clean towel, in a bowl and let rise until doubled in size, about 1-2 hours. Dough can be refrigerated for up to 48 hours. Flour covered dough can also be placed in a freezer bag and placed in a freezer for up to 1 month. When ready to use, make sure pizza dough is at room temperature. In a small bowl, mix together marinara and barbecue sauce. Prepare 9-inch pizza pan by scattering corn meal evenly over it. Spread dough onto prepare pan and add spread bbq-marinara sauce evenly over the pizza dough. Scatter shredded cheese evenly over the sauce. Place pulled pork and onions over the cheese. Bake for about 10-15 minutes, or until cheese is brown and bubbly. Garnish top of pizza with cilantro and arugula and serve.